THIS year’s Fête de la Vapeur festival – the 10th to be held – was the biggest ever with steam locos visiting from England, Belgium, Germany and Switzerland, along with others from museum railways elsewhere in France. In total 15 different steam locos were at the event, which ran from Friday-Sunday, April 14-16. 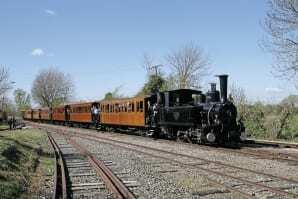 Fourteen of the locos were in steam, working or on display, on three different gauges of track. In addition to six of the CFBS home fleet of metre gauge steam locos, three visiting steam locos were in use, including 1909 vintage 0-6-0T TIV 75 from French museum operation MTVS, with the others from much further afield.